I have been in Sapporo for almost 3 months now and I have experienced so many new things it seems as if everyday I do something I've never done before or eaten something I've never tried before. When I first arrived I was expecting really cold weather and lots of snow it when I arrived it so hotter here then I could have imagined and I thought to myself is it always going to be like this? Later as I got settled and the autumn season started to kick in the rain, the wind and the cold weather reminded me of my home town and I felt a bit more at ease considering I am in a different country. I was told many stories that when winter comes it would be colder then I could imagine and of course they were right. It doesn't snow often in England I have seen it snow maybe about 4 times in my life and whenever it did it seems the whole country would stop and panic as if the world had ended. So now that winter is here and the snow has fallen to me it's truly amazing I've only seen this much snow on TV everything had been turned into a glorious white the roads, the buildings even people when they walk outside in the snow storms is covered with soft powdery snow. I'm honestly enjoying every moment dispite the freezing cold temperature I can't wait to so more and I am fascinated that the people living here think it's just normal I'm looking forward to my first ever white Christmas and I'm so happy that I get to spend it in Sapporo. My god everyday is so busy right now! I don’t even have the time to sleep properly! You see, I started a project called Hult Prize, a university wide competition for refugees. With my team, we’ve been doing everything we could do every single day for the past month, researching, contacting several companies about certain subjects, writing, meeting, researching again, fighting about every single thing to make every part of the presentation perfect. And guess what? TURNS OUT SOMEONE ELSE ALREADY DID OUR IDEA! Yesterday we were so frustrated about everything, and decided to quit, since we didn’t have a report or a presentation for deadline, which was today. But then our team captain was like “No! We will finish this!” She was so scary, I immediately saluted her saying “Sir yes sir!” out of fear. So from dusk ‘till dawn we’ve been writing reports and speeches today, to prepare for the presentation which, you’ve guessed it, TOMORROW. We basically did everything in a single day for a presentation which other teams had a month to prepare for. You can’t guess what kind of a “tokitoki” moment I’m having right now. I’M SO NERVOUS! I’ll be speaking in front of an ambassador, President of Hokudai, CEO’s, very very important (and rich) people. And if we get it right, if we win, we get to go to SAN FRANSISCO, US. Not for holiday of course, for the second part of the competition. So yeah, this is so tiring and making me feel so nervous, but in a way, I guess it’s fun. We’ll see what happens tomorrow, I just hope I don’t embarrass myself in front of everyone! 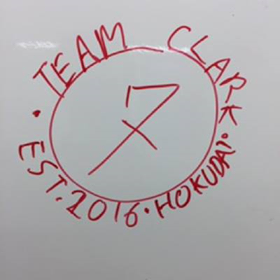 Also our team’s name, Team Clark. Guess where we got the name from. 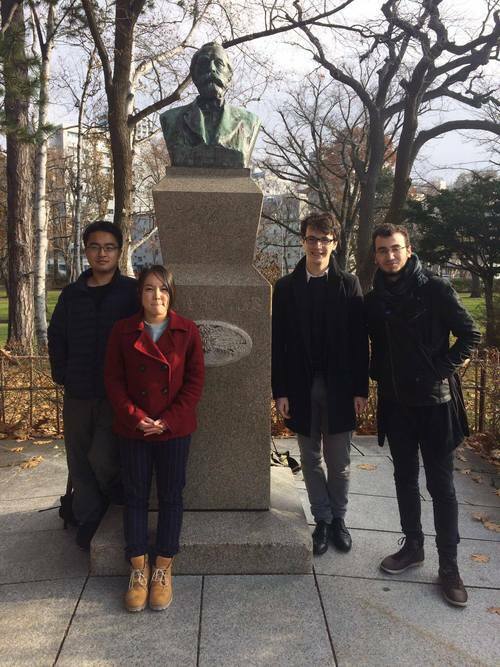 So I have been in Sapporo for two months now, time has gone very quickly. The weather also changes very quickly. One day the leaves were turning gold and crimson for the Autumn and the next white snow was laying across the fallen leaves. The first snow came early in November this year. I woke up in the morning and opened my curtains to let the sunlight through the windows. I was suprised to be greeted by whiteness. Snow glittered in the sun and the cars in the carpark below lay covered in a fresh heap of powder. Immediately I went down stairs to the front of my dormitory and started building a snowman. It didn't take long for me to be joined by another resident of my dorm. Together we sat outside, our fingers growing numb as we rolled balls of snow. We built a large bear out of snow and decorated it with sunglasses and a scarf. In Australia it does not snow in very many places. We have only a couple of ski resorts on very small mountains. Even in these areas the snow is very little and ski resorts must produce artificial snow to keep their resorts running. I really love Sapporo covered in snow. The city looks beautiful surrounded by mountains and the naked winter trees turned white by fallen powder. In Australia my family and friends are uploading photos of barbeque lunches on the beach and boggy boarding in the waves. Yet here I am in Sapporo, the snow is falling and the temperatures can be negative numbers. Completely opposite. I'm looking forward to surviving my first Sapporo winter!